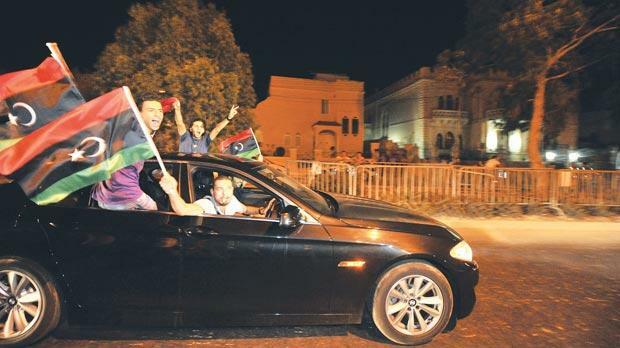 The Libyan community in Malta yesterday celebrated “a free Libya” as Colonel Muammar Gaddafi’s 42-year reign came to an end and a new era dawned on the country. 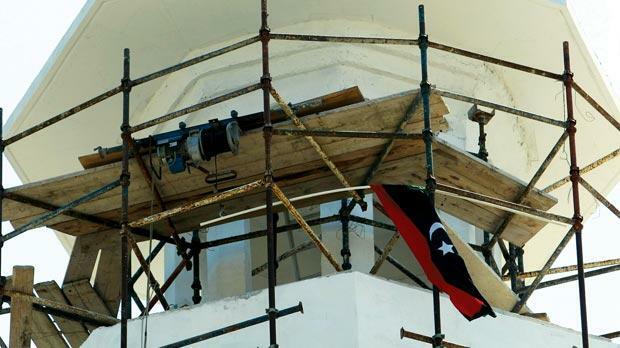 The three-coloured independence flag replaced the green flag on several buildings around the island, as Libyans carcaded through the streets pulling down “Gaddafi’s family flag”. A group yesterday morning headed to the Libyan school at Ta’ Ġiorni “to remove every trace of the dictator”. The gates were opened by a security guard wearing a white cap embroidered with the independence flag. Earlier the same group had raised the independence flag on the Libyan ambassador’s residence in Madliena. Youssef Lamlum, the spokesman for the community, said the flag was hoisted in agreement with the ambassador, Saadun Suayeh, who is in the UK. Mr Lamlum added that although the ambassador was expected to stay in office temporarily, Libyans wanted “new blood” at the embassy. 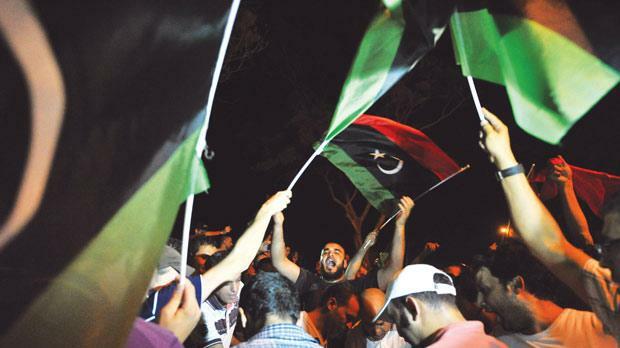 During the early hours, the independence flag was also hoisted at the Libyan embassy. At the Ta’ Ġiorni school, they tore up every single Green Book they could lay their hands on and several others dictating Col Gaddafi’s policy. A sense of enthusiasm, which they said they had never felt before, emanated from the men as they pulled down pictures of the colonel. Their anger spilled over when they spat on the pictures, drew nooses around Col Gaddafi’s neck and trampled on T-shirts bearing his face. Boards depicting verses lifted from the Green Book were torn down from the walls and shredded. 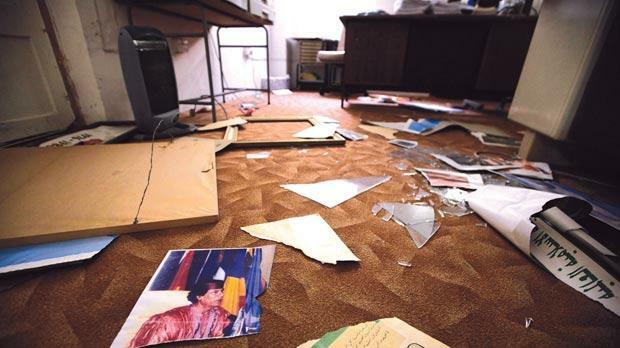 They also entered the “Revolution Guard”, a room found in all government buildings, full of shelves upon shelves of Col Gaddafi’s policy books. The Libyans said this was the room where people were taken and threatened if they “disobeyed”. “Can you believe someone could stuff so many pictures of that dog in one small room,” they asked, as they piled them up. One of the Libyans waved a torn cover of the Green Book over his head, yelling “the dog’s days are truly over”. Youssef Lamlum, 47, has been in Malta for 20 years after escaping the repression in his country. He hopes he will soon set foot in his hometown of Misurata for the first time in two decades. “No man can describe in words what one feels when for decades his family had to endure hardship because my brother was critical of the Gaddafi regime. I had in the past six years lost all hope in the Libyan people. I thought Libyans had accepted their fate and accepted the dictator... however, when I heard about the revolution in Tunis I was sure this was the end of Gaddafi’s regime. My heart cries out for the hundreds of youths who lost their life and will not be able to see a free Libya. This was their dream as much as it was our dream. God willing, the Libyans will join forces and turn these martyrs’ dream into reality. Abdul Salam Ali, 39, graduated in accountancy and had enrolled as a soldier for two years. He fled Libya in 1994 and has since worked as a painter in Malta. This is heaven on earth. I have celebrated throughout the night and early morning and I don’t feel sleepy at all. Work will have to wait! I’m too excited to concentrate. It’s difficult to return to Libya permanently, because I feel split between Malta and Libya. Both are my countries, and although my relatives are in Libya, I started building my own family in Malta. Salah Bin Hussein is from Tripoli and he settled in Malta in 1999. He is a former schoolmate of Abdul Salam Ali and is an accountancy teacher at the Ta’ Ġiorni Libyan school. My mother and sister, who live in Tripoli, and were in the past few days scared to death, are now relieved. At the moment I still feel as if I’m living in a dream and all I can think of is to thank God. We have come a long way and I must say the majority of the Maltese have stood by us. This has encouraged us to believe in our dream, because Malta is our country as much as we feel Libya is. Jamal Algazali, 44, will today head to Tripoli with his family, to celebrate “a free Libya” with his relatives. “These last months were six of the most important months in my life. We hope that the young martyrs’ blood has not been split for nothing and will not go to waste. We hope to be able to organise Libya little by little. This blessed month of Ramadan is really the month of victory. Muhammad conquered Mecca on the 20th of Ramadan. We started our victory on the 20th and won Tripoli on the 21st. Elmhadbi Abugela, 39, has travelled between Malta and Tripoli for the past 26 years but has not set foot in his country in the past two months. “We never thought this kind of happiness existed. On Sunday, we were reborn. I’ve lived all my life under a black cloud. We want a new Libya, we want to change everything. The Martyrs’ Square has replaced the Green Square. Our three-coloured monarchy flag has replaced the green flag. This change will all go down in the story of our life. Libyans have to, however, realise the country doesn’t have to rely so much on oil exportation but can prosper in the tourism industry as well.